Enter to be June's Soldier of the Month here! At the beginning of the month, the Backstreet Boys set sail on their sixth official cruise with two thousand of their biggest fans. 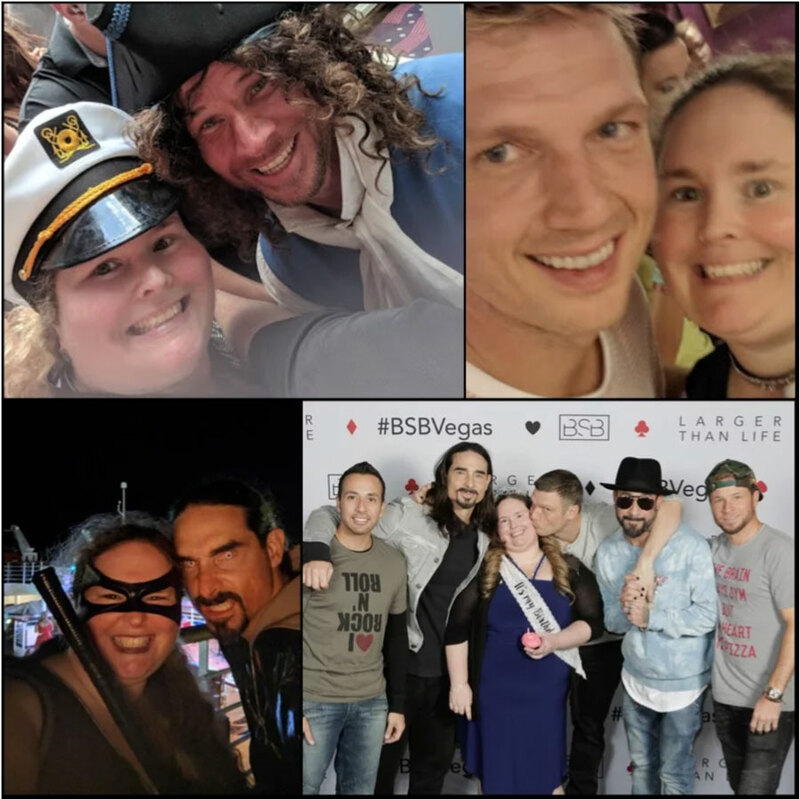 One of those fans, Dawn Hudak, celebrating attending her fourth Backstreet Boys cruise, having been in 2013, 2014 and 2016. Over the years the Backstreet Boys have sailed to Key West, Mexico, Nassau, Half Moon Bay and even toured the Mediterranean coast in Europe, but this year, a trip to Grand Turk turned into a trip to Nassau due to weather. To Dawn, the cruise could have gone anywhere and she would have been okay with it. That is why Dawn has been named the May 2018 Soldier of the Month. Even though the cruise’s destination, like Dawn said, she had an amazing time on the boat. While she doesn’t care where the cruise goes or if even just stays sailing in the ocean, she does have an idea for a cruise location – Hawaii. “If I had to choose, I would love a cruise to Hawaii or from Hawaii. It is so beautiful there. Or even a better place I have never been, the South Pacific or Tahiti. It would be a dream cruise for many people,” she said. What do you do for a living? : Professor/mental health counselor/play therapist. I teach graduate students how to become counselors, especially how to work with children. I also go back and forth sometimes doing play therapy with children when I am not teaching full time. Back in college, I always thought it would be cool to work with entertainers. So if any of you boys need a counselor, or having problems with your kids…call me! How long have you been a BSB fan? Seems like forever, but I guess was over 20 years ago. What is your favorite BSB memory? I feel it definitely was the 2018 cruise. I can only describe it to others as a mystical and magical moment that while we were in the middle of the Caribbean something took over. It was 1999 again. BSB was singing every single song from the “Millennium” album. I start crying during “Back to your Heart,” and then proceed to continue to cry for the next half hour. After some other songs, it starts to rain, and then Nick goes over to the pool, jumps in, others jump in, and I proceed to jump in as well. I got to clown around with Nick in the pool, which I never imagined would happen. After drying off, Nick and AJ continued to perform solo material and alternative/rock songs from the 90s. It was just an amazing night. What is your favorite BSB song and why? “No One Else Comes Close” is my favorite. I always loved the song and thought no one else comes to close to the Backstreet Boys. It just brings me back to high school when I hear it, and all the feels that come with those memories. Who is your favorite Backstreet Boy and why? If it is just between the two of us, I will tell you. I would have to say Nick is my favorite. I think the blonde hair and blue eyes just seduced me, as that type typically does.. But it probably was just his voice that lured me in and hasn’t let go of me yet. But he also is silly and fun, and remember I love to play, and we are both Aquarians so I think that links us in some ways. He’s also closest to my age and it feels like we have grown up together in a lot of ways. To see everything he has had to overcome throughout his life and be where he is today makes me incredibly proud of him. He has really worked hard to move past so much negativity in his life, found love, created a family, and has become an awesome father. But in the end, I have had some fun memories with each of them over the years and love them each in their own ways. How has BSB impacted your life? BSB has brought me so many fun times with my mom, new friends, and old friends. I have been able to travel all over from Europe, to Mexico, to the US whether it was for a solo or group event. I also have been able to do some really cool things that was I was afraid of while going to concerts for them like swimming with the dolphins in January in Mexico and zip-lining in Vegas. 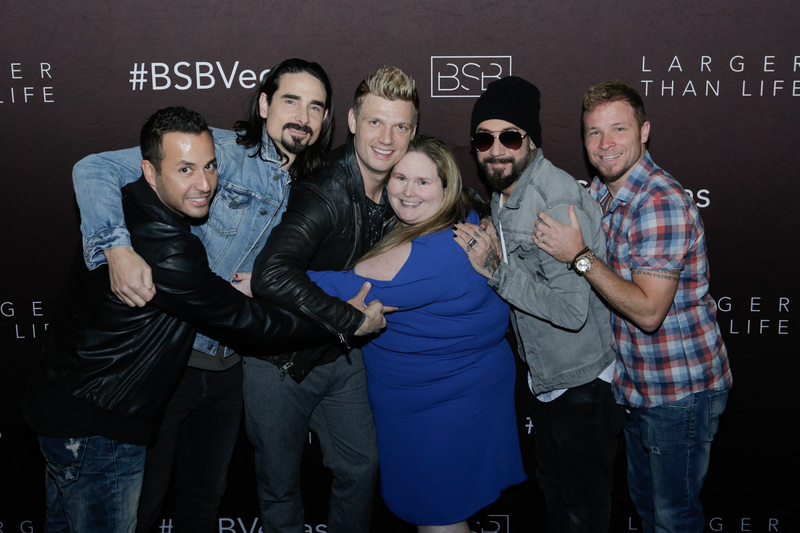 What is your favorite thing about being a BSB fan? I think my favorite thing about being a fan is that I can still be one after all these years. They are still together after 25 years singing and dancing and are still making music, breaking records, dancing their butts off, and giving us a time to remember. How many times have you seen the Vegas show and are you going back this year? 9 times so far including March and July 2017, February 2018 and I plan on going to probably at least 2 in July 2018. What has been your favorite BSB moment over the past 25 years? One of my favorite memories was being in Times Square for the release of “Black and Blue.” They had just gotten off the 100 hours around the world flight and went to TRL. I was outside with some friends. It was the first time I was up close to them that I could touch them. There were thousands of people and they all rushed over to Virgin Megastore to see them. It was just such a cool thing to even be there. Another favorite moment was when they received their star on the Hollywood Walk of Fame. I was lucky to win a ticket to go to the 20th anniversary event and stayed for the WOF ceremony. I ended up with a pretty good spot. There were thousands of people in the street to support them. But the emotions they had seen how many people cared about them after so long, it really touched them. It touched me just to be there with them. What has been your favorite cruise theme that you've been a part of? Millennium was probably favorite because of the music they played from the album and the entire night, which I already mentioned a few times here. So another favorite cruise theme was in 2016 when I went with my mom on the European cruise. I am shy when it comes to some things, and Leather and Lace night definitely was harder for me at first, and my mom had no clue what to wear. We figured it out though and looked cute. But the night was so funny because of the costumes the boys decided to wear. I was able to get them to come up to the disabled section since it had rained again and we were inside on the deck above the stage. AJ is always so good and came up to them, my mother and I were like right at the entrance of the section. He comes in and leans down and gives my mom a hug and she tells him “you’re going to get it” with the belt of a purse she had which was part chain and some handcuffs. He laughed pretty hard, and we were hysterical. He made a lasting impression on my mom because she still laughs about that all the time. It was awesome to be there to see my mom become so naughty, but AJ sure does know how to bring it out of us, doesn’t he? This was my favorite memory until Millennium night. It was so amazing the music, the emotions of the night, the rain, and jumping in the pool. I saw Nick and he looked surprised I was in the pool and I said it was his fault I was there. He said “oh yea” and grabbed me and flung me backward basically getting dunked. It was so surprised that he did that but was caught in the moment. That was really just the icing on the cake that night. One more cool cruise memory was on the last night, I Nick gave me his shoe from his Baby Spice costume…so it was pretty cool to end the cruise with a part of his costume that was such a classic one!